FIFA 19's Team of the Week is a collection of 23 footballers who are hand-picked by EA Sports based on their performances in their respective leagues the previous week. Footballers who have managed to outperform their peers make this list and receive a ratings boost for a limited amount of time. Players can get a hold of these TOTW cards by either unlocking them or by purchasing them to help them build their ultimate team. 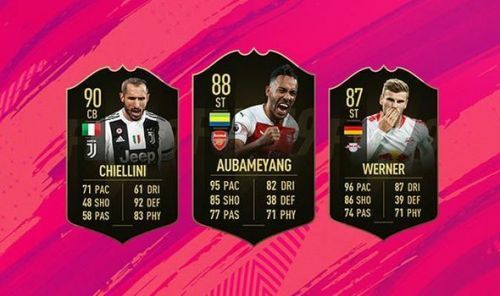 Without further ado, let us look closer at the 23 players who made FIFA 19 Ultimate's Team of the Week. Jordan Torunarigha scored a goal and provided an assist as Hertha BSC beat Hannover 96 on Matchday 13 of the German Bundesliga. Interestingly, the 21-year-old German centre-back opened his goal tally of the 2018/19 season with this match. Joe Lolley was involved in all of his team's five goals against Aston Villa on Matchday 19 of the Football Championship. The wide midfielder from England scored a goal and provided four assists to help his side secure a point in a 10-goal thriller. Igor Angulo netted two goals and provided an assist as Zabrze beat Wisla Plock 4-0 in the Polish domestic league. With those two goals, the Spanish striker took his overall tally to 11 goals in 17 league games. Robert Skov netted a hat-trick as his side beat AC Horsens with a dominating 6-1 scoreline. The 23-year-old wide midfielder from Denmark now has 13 goals and 4 assists in 18 league games. Tammy Abraham is a 21-year-old English striker who currently plies his trade for Aston Villa in the Football Championship. Abraham netted four goals in a classic 10-goal thriller against Nottingham Forest that finished level with five goals each. The Englishman now has 11 goals to his name in 14 league games.